Only one day in, Milan Fashion Week gave us some of the most memorable collections of this fashion month so far. N21, Jil Sander and most importantly Alberta Ferretti. The Italian designer showed a new side of her talent that could potentially take her brand in another direction, catering towards a younger niche. 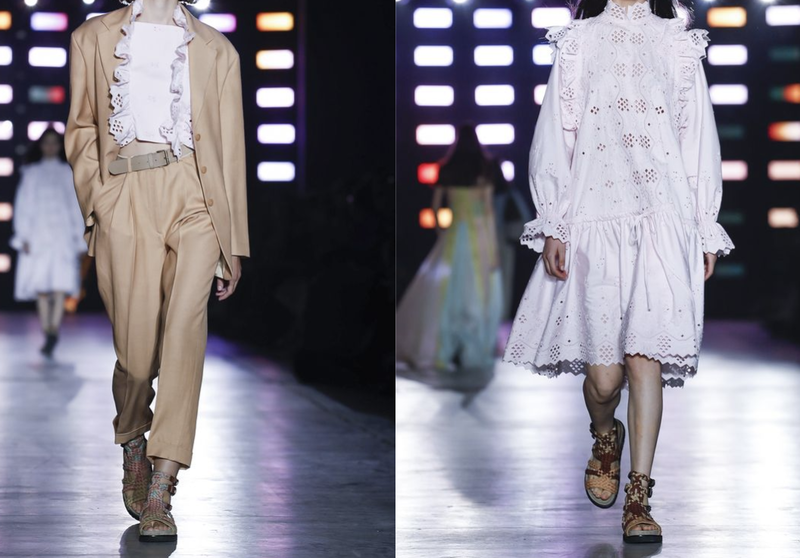 What made Ferretti's SS 19 collection special was her pairing of colors and materials on opposite ends of the spectrum together. The contrast between the pastels and the darker earth tones and the striking contrast between the delicate lace and rougher denim of various colors were very unexpected yet worked together incredibly well. The incorporation of crochet was consistent within several outfits sent down the runaway, shocking us, as it was very different from what we had expected from Ferretti. Ruffles were the statement detail of the collection. The designer incorporated them into a large number of pieces, which elevated the looks to become more feminine. Her incorporation of ruffles resulted in several statement pieces that are still very wearable and flattering on the body. Ferretti closed the show with 11 all black looks, some of which reminded us of her fall 18 collection. The all black looks did not match up with the vibe the rest of the collection was headed towards. They seemed slightly out of place, although it is understandable why Ferretti has made them part of her collection. These looks were something familiar to her and her design aesthetic, opposite to the rest of the collection. Overall the collection was very fresh, which was reflected by the models' effortlessly styled hair and natural, glory makeup. Ferretti has been a favorite of ours for quite some time and her ability to reinvent herself as a designer while still remaining recognizable is fascinating. Ferretti was the talk of the first day at Milan Fashion Week, and not just for her start-studded lineup.